I'm not a U.S. citizen/resident, can I still travel on this tour? What can I expect from a People-to-People tour? Can you arrange flights to Cuba for me? Is flying through Mexico illegal or suspicious? What are the entry requirements to Cuba? What is the Visa? Yes! 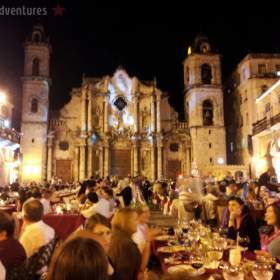 This tour is perfect for anyone looking for a more inclusive tour that gives you a deeper understanding of Cuba. If you are living in the U.S., regardless of nationality you are subject to all the same regulations as U.S. citizens. We welcome travelers of all ages! It is your travel style rather than your age that will determine if our tours are right for you. Our accommodations and modes of transportation are comfortable, but by no means luxurious. Our tours cover a lot of ground and move at a fairly rapid pace, so they are better for a more energetic traveler who can do medium grade physical activity (there's a lot of walking!). If you like to immerse yourself in the culture of a country, from the pretty to the gritty, then we think you'll enjoy our tours whether you are a baby boomer or a millennial. Learn more about our tour style here. People-to-people is a designation used by the U.S. Office of Foreign Assets Control (OFAC) to refer to travel to Cuba for educational exchanges that don’t involve academic study. Simply put, it’s to describe travel to Cuba that is for the purpose of learning and engaging with the people of Cuba, to encourage and support the Cuban people and to promote independence from Cuban government authorities. The goal may be that the more Cubans are exposed to the world around them, the more dissatisfied they will become with their current government, and hopefully that dissatisfaction will effect change. You can expect a full-time schedule (around 7-8 hours including travel time) of educational exchange activities that will encourage interaction with locals. With President Trump's new changes as of November 2017, this category applies only to tours sponsored and chaperoned by a US organization. Our tours now qualify under Support for the Cuban People travel instead of People to People, which is why we are able to offer them more affordably than we could offer a sponsored tour, which would require us to send a representative from the US to accompany the group. Additionally, by qualifying under individual Support for the Cuban People travel you have more freedom to decline participation in any activity that doesn't interest you, as long as you still maintain the full schedule required by the law. However, we plan these tours so that you’ll be having such a great time, there’s nowhere else you’d rather be! If you aren't comfortable with not being on a People to People tour, please let us know, special arrangements may be available! Absolutely! Traveling under the Support for the Cuban People category, you are welcome to extend your time in Cuba by staying a few days late or arriving early as needed to accommodate flight schedules. This would not be possible on a People to People tour. We are happy to help you make your accommodation arrangements. An extra night at the B&B is US$55/$65/$85 (sgl/dbl/trpl) per night for a standard casa, or for a superior class casa (the type used on our tours) the prices are $90/$100/$110 (sgl/dbl/trpl). We can also book hotels, just contact us to inquire. We offer several day tours you can take with a few extra days in Havana, see our Havana day tours here. Absolutely not! How you choose to get to Cuba is a matter of convenience and cost for you. Many people on the west coast find it less expensive and more convenient to fly from Mexico City or Cancun. Since you are on a licensed tour, you can fly from anywhere you want, including Miami. Tourists are required to have a valid passport and a tourist visa to enter Cuba. There is conflicting validity requirements for your passport, some sources say it must be valid for three months beyond your dates of travel and some say it must be valid for six months. To be on the safe side, it is better to renew your passport if it will expire within a year. The Cuban Visa or Tourist Card is not unique to US travelers, it is required of travelers from around the world. Although it is commonly confused with the General License, which is specific to US travelers, one has nothing to do with the other. You can read how to get the visa here.